Another topcoat post this week. Last time I showed you NYC Rock muse, a smoky topcoat. This week I am showing you a layering glitter topcoat. Black and white glitter polishes are kind of a big thing at the moment. A lot of Indy brands have made them and now the regular brands are following suit. Which I think is a good thing, because I love the look of black and white glitter over bright colours! So today I am showing you L'oreal Color Riche Confetti Top Coat. It consists of small and medium black and white glitter in a clear base with just the tiiiiiiniest amount of shimmer. As you can see in the bottle close-up at the top, the shimmer is really mixed in with the glitter, and not part of the pink base I used. I really like this, it gives the overall look a little bit of extra shine but doesn't change the look of the crème base to a shimmer. The base polish btw is China glaze - Dance baby, wich I picked because it was still untried and I wanted something bright to make this manicure pop. After I did this manicure I picked up an extra bottle of the confetti, so I guess that shows how much I love this :D I hope you guys like it too, and see you next week! pretty!! Those L'Oréal tc are not available here, at least at the moment but I want this tc! :D Oh my gosh, so glad to see L'oreal jump on this glitter wagon! Too bad these aren't available here yet! Love it! Really liking how big companies are paying attention to us and indies now! Pretty! I didn't know L'oreal had glitter topcoats! This combo is so cool! I love the combination of black and white glitter over bright colors, too. I have never come across this top coat over here, but I will keep my eyes open next time I'm at the drugstore! Oh baby! I want to get my hands on that! Hmm I don't remember seeing this Loreal polish in my drugstore but I'll be keeping a lookout for it. 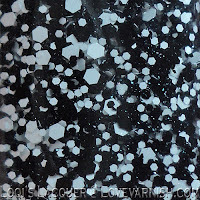 I quite like the look of black and white glitters layered over different colours as well. Oh wow I love the loreal over the pink. It really does pop. Maybe they will come in a while? We have 2 big drugstore chains here, one of which does sell them, one doesn't. Yes me too! I love the look of a lot of glitters but not the indie prices and availability :( These are much more affordable! Thank you :) Yes it's a great development! Thank you :) We have 2 big drugstore chains here, one of which does sell them, one doesn't, so maybe check out a few different ones! Maybe it will come soon, or check another chain of drugstores :) We have 2 big drugstore chains here, one of which does sell them, one doesn't. Wat een gave combi over dat roze heen. Goed idee! I wonder if we're going to get these over here in the states. I can't say I've seen that style of L'oreal bottle here, or maybe its just that caps that look different then the ones we have here. I believe the rest of the polishes all had gold caps, only the topcoats had black. That looks so pretty over this pink! I wish this top coat was available in the US. It's gorgeous.